Also known as Middle Pinnacle, this is really two peaks, separated by a high col.
A short bit of fun up a dribble of ice to a small snow patch and the ridge. A charming line. 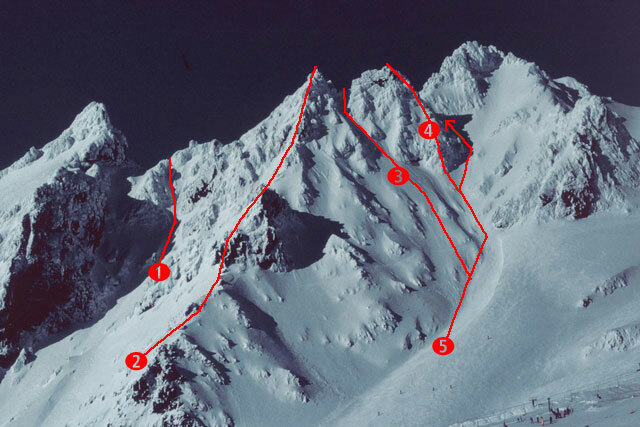 The lower gendarme can be easily avoided by climbing to the col beyond from the south side, but there are more tricky sections towards the top. A gully line leads to the col high on Second Pinnacle between its two peaks. From low in Gully 2, climb the buttress on the southern of the two peaks. The gully between the First and Second Pinnacles provides direct and rapid access to (or off) the ridge.